Home » Caretaking » 4-30-2016 CRC Streams Cleanup & Nature-Inspired Art! 4-30-2016 CRC Streams Cleanup & Nature-Inspired Art! 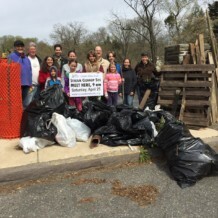 Friends of Glen Providence Park is proud to be helping the Chester-Ridley-Crum Watersheds Association (CRC) with their 19th Annual Streams Cleanup! This year CRC volunteers will remove trash at more than 30 sites along Chester, Ridley and Crum Creeks and their tributaries, including Broomall’s Run in Glen Providence Park. The Annual Streams Cleanup is just one of many activities that CRC undertakes to further its mission “To protect, conserve, and restore the natural resources of the Chester, Ridley, and Crum Creek watersheds.” This is our fifth year coordinating the CRC Streams Cleanup for Glen Providence Park. In addition to stream cleanup, we may have other projects for you to choose from – such as clearing invasive plants along the trails. Bonus for volunteers of all ages: Nature-Inspired Art! Before the cleanup finishes at Glen Providence Park, volunteers can have an additional reward – an art project under the majestic oak tree by the stage! Use yarn and acrylic (permanent) paint to transform sticks and rocks into art. Once dry, the art will be placed around the Park to add to its beauty. Come back throughout spring and summer to see how many you can find on your explorations! Free and open to all ages. Led by Art For Everyone & Media Arts Council. We hope to see you April 30!